We did not get much done today. As a work weekend this has been largely a bust. I spent much of the morning doing some design work on the built-in chicken feeders and nest boxes I'm working on, but made little progress because I could not get the saw I was working with to do the things I want. I need to spend some time and make a good jig. Then Noel came home from a cultural event and we got a larger concrete drill bit. 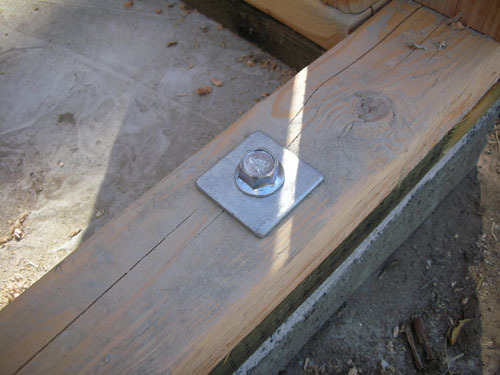 With the larger bit the anchor bolts went into place perfectly. Progress was slow, but we got ten bolts in around the foundation. This shed is not going anywhere. Our next order of business was correcting some mis-framing we did yesterday. Somehow, I failed to put the window for the chicken room in the right place, and it ended up way too far over to the right in this photo, so the center wall overlapped it. We knocked out that stud and put two more in on either side of where the window belongs. 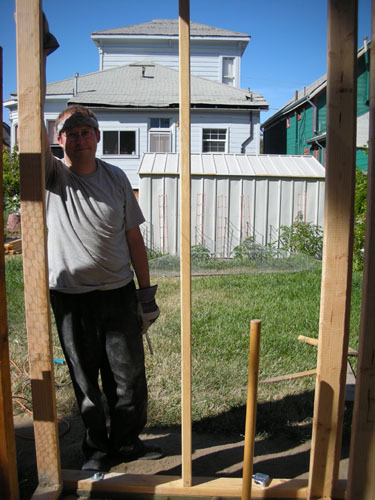 Then we put in two studs to use as nailers for the plywood lining of the chicken room. In the meantime, the chickens were just sort of roaming around the yard, and every now and then they would come and check on our progress. And here we are at the end of a really frustrating weekend. 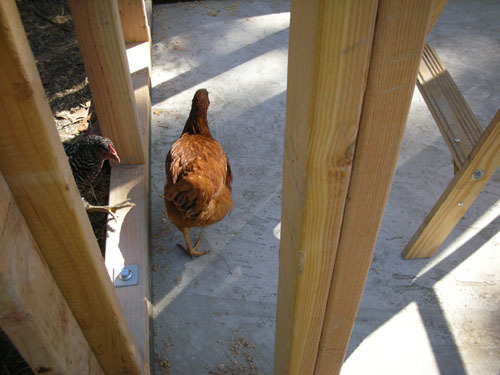 We have plywood up on three walls of the chicken room (the fourth wall is the doorway). We have the shed attached to its foundation. 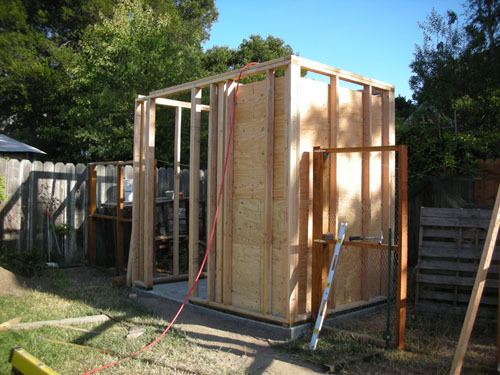 But we need to get siding, we have a lot of blocking and the framing around the windows to put in (after which we will cut out the windows from the chicken room, I guess). And, oh yes, a roof to frame out. I guess it's a good thing that it's not going to rain here until October at the soonest, because this has gone much more slowly than I had hoped. On the other hand, the little shed side of the shed feels really great. It's going to be a terrific room. Wow, how cool is that? My husband and I keep talking about keeping chickens in the backyard, so we can get our own "organic" eggs. Problem is we have both dogs running loose in our street, as well as jackals in the fields behind where we live (we live in Israel), so we worry about the chickens needing a sturdy shelter. This looks great - I'll show him this post later today, see what he says. With jackals and dogs you will definitely need a sturdy shelter; a wire fence is a minimum. Other predators you may have are hawks (we have those, as well; that's why I put up the aviary netting), cats, or rodents of various sorts (who will mostly just get into the feed or steal eggs). But securing a chicken yard against all of that is not that complicated. Most guidelines I've read suggest a heavy wire fence buried 12 inches below the soil surface around the entire yard, and some kind of aviary netting or other cover over the top (chickens like shade so my long-term plan is to put in a roof). Then you will appreciate that when Noel got home from his cultural event, he told me he was going to get out of his nice clothes and "Turn up the Freedom Rock."